NOTE: This was originally posted on my now-defunct PencilThings blog on October 25, 2007. A reader sent me a little generic vinyl eraser he found, and was impressed with its performance. Although I don’t have the original pictures from the post, I recreated them, only without the purple Dixon mentioned below, which I threw away a couple of years ago. I love our readers. The commenters we get from the pencil community are friendly, opinionated, and intelligent. And I’m not saying that just to butter them up — since I’ve joined the Pencil Things blog, I’ve met other people who genuinely care about office supplies. I thought I was a freak. It’s nice to know there are others like me out there. The generic-brand eraser from Dollar Tree that Barrel of a Pencil sent me. I post comments under the nom de pencil Barrel Of A Pencil. If possible I would like to send you one of the little generic white vinyl erasers I wrote about in my comment posted to Pencil Thing’s ruminations on the timeless question Why The Pencil. (Check out the post here. -AW) Ideally, I would like to see you review this little gem either on its own merits or in competition with the usual name brand suspects (Staedtler, Pentel, Faber-Castell, etc.). I think its a whiz-bang of an eraser and a steal at 12 1/2 cents (8 for a dollar). Just so everyone knows, I usually prefer my eraser to be on the end of the pencil. It’s easier to use, and I think the extra weight the eraser and the ferrule adds to the pencil helps me balance it. However, sometimes I just have to use my ferrule-less Palomino. That’s when I want to keep an eraser by my side. I opened the cellophane, and was pleased by how soft it really was. It was sort of squishy, a little like those stress balls everyone has but never seems to use. Staedtler Mars plastic eraser. The cream of the consumer-grade crop. For the review, I pitted it against a Staedtler Mars plastic eraser (95 cents, Product Page), and just to shake things up a bit, an old purple Dixon rubber eraser I found at the bottom of my desk drawer (3 for $1.00 almost anywhere) just for contrast. 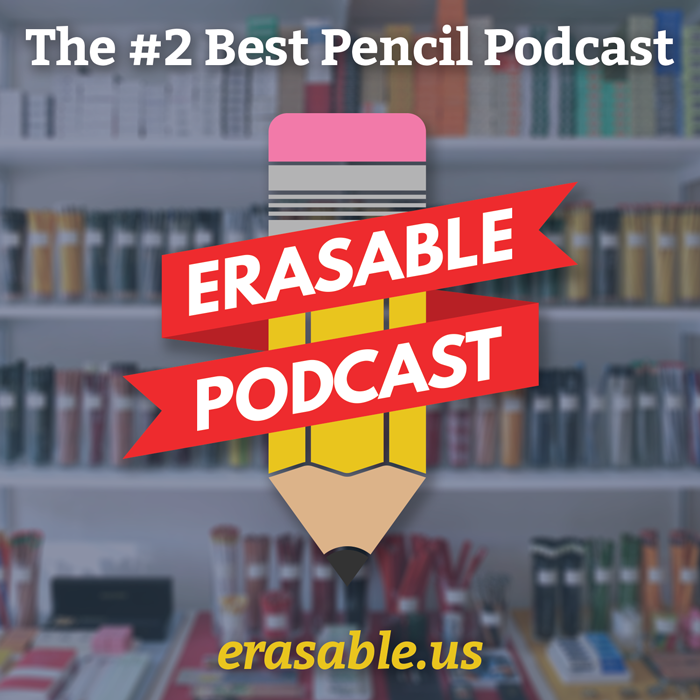 Please keep in mind that this is not a test of different eraser types — vinyl vs. rubber vs. moldable, etc. That’s for another review. For the purposes of this post, I tried to keep my subject narrowed to these particular erasers. Both the Brand X and the Staedtler Mars came in a cardboard sleeve, which doesn’t really serve any purpose I can gather except to keep the rest of the unit from getting dirty. It’s kind of like the little sleeve they put on ice cream cones. Eventually, you have to take it off when you start to use it up. In the meantime, they do make the erasers look nicer, don’t they? For 13 cents, I have to tell you and Barrel of a Pencil that the Brand X eraser worked like a charm. He definitely got his money worth. I usually gravitate toward plastic erasers because, unlike rubber erasers which get debris all over the page, plastic/vinyl erasers (which are both the same, aren’t they?) just leave one little scrap, or roll, which can be picked off and thrown away. It was a smooth glide across the paper, and perhaps my only objection is that it is too soft. It did leave a bit of a mark left over, but after another couple swipes across the words (done after I took the picture), they were completely gone. If price is no object, though the Staedtler 95-cent eraser was the best. Check out the fact that there is almost no mark left over. It was just as smooth as the Brand X, and it was firmer. I wasn’t afraid the eraser would crumble off onto the paper. The Dixon, as I expected, wasn’t great. I can still almost read “This is a test” left over on the page. To be fair, much of this is due to the fact that the eraser is probably a couple years old, and dirty. I only put it in the test to make a comparison to most of the erasers out there. To be fair to the Brand X pencil, the Mars is a good one-and-a-half times longer. Even if I were able to buy it smaller, the eraser-to-price ratio would make it about 63 cents, nearly five times the price of the Brand X. In a nutshell: If money is no problem, and/or there are no Dollar Trees in your area, get a Staedtler or another quality name-brand. However, pound for pound, Barrel of a Pencil’s little find is worth it. You’re sacrificing a bit of quality, but it erasers very cleanly, and you get all the benefits of a vinyl eraser — no debris! A note to our readers: Anyone recognize that Brand X eraser? Do you have any manufacturer contact info? Thanks, Barrel of a Pencil! Anyone have any finds they want to pit against the name brands? Let me know! ← Open Thread Tuesday: How do you store or display your pencils? Thanks for this post. I still stand by the Pilot Foam eraser — this thing is at the very least supernatural, if not extraterrestrial. It erases as if nothing was written in the first place (maybe Stalin would have liked this eraser). You can get them over at JetPens for a buck and a half. Oooh! I have not tried this one. I’ll check it out. It looks like it might be similar in texture to the Brand X one I reviewed. My personal favorite is the EraserMate Black Pearl. It’s not necessarily the best in performance, but it’s shape is really great to hold and to slip in your pocket. the sleeve actually helps to keep the eraser form breaking in half. The original Staedtler MArs PLAstic erasers were soft and somewhat breakable, so if you took off the sleeve and held it by one end the thing would break in half. The formula has changed over the years and I find they are less breakable than they used to be, but I still leave the sleeve on, just for old time’s sake.